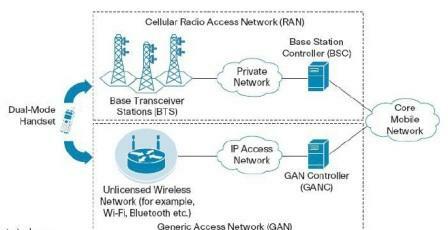 The Generic Access Network (GAN) is an evolving wireless communications system in which mobile phone sets function seamlessly between local area networks (LANs) and wide-area networks (WANs). Using GAN technology, a cell phone subscriber can communicate by voice, data and multimedia. As GAN technology is implemented, cellular telephone subscribers can expect improved coverage, the ability to use a single phone set for all their voice communications and perhaps cheaper rates with a single bill for Internet and voice communications. Main application of this GAN/UMA is the Dual-mode Handset service. With dual-mode services(GSM and Wi-fi), subscribers make calls from outside the home as they would ordinarily, using the GSM radio network at the standard tariff rate. But inside the home, the call travels over the subscriber’s wireless broadband connection, so the operator can enjoy a similar economic structure as VoIP-over-broadband provider. In September 2004, the participating companies published the initial UMA specifications and formally introduced them to the 3rd Generation Partnership Project (3GPP) standards body. In April 2005, an unprecedented eight months later, the UMA specifications were incorporated into the 3GPP release 6 specifications. While referred to as "Generic Access Network" or GAN, within the 3GPP specifications. In mid 2006, mobile operators around the world began announcing their intention to deploy dual-mode handset (DMH)-based UMA services. Throughout 2007, there were constant announcement of new UMA-enabled dual-mode phones to support the commercial service offers. In early 2008, the first commercial UMA-based fixed line VoIP service appeared as well as the first UMA-enabled softmobile client. The GANC provides dual-mode handsets with alternative access to GSM voice and GPRS data services. For voice traffic, the GANC integrates directly into an operator Mobile Switching Center (MSC) through the A interface. For data traffic, the GANC integrates directly into an operator serving GPRS support node (SGSN) through the Gb interface. Termination of secure tunnels (through IP Security [IPSec]) with InternetKey Exchange Version 2 [IKEv2]) from the handset. GAN/UMA is not the first system to allow the use of unlicensed spectrum to connect handsets to a GSM network. The GIP/IWP standard for DECT provides similar functionality, but requires a more direct connection to the GSM network from the base station. While dual-mode DECT/GSM phones have appeared, these have generally been functionally cordless phones with a GSM handset built-in (or vice versa, depending on your point of view), rather than phones implementing DECT/GIP, due to the lack of suitable infrastructure to hook DECT base-stations supporting GIP to GSM networks on an ad-hoc basis. GAN/UMA's ability to use the Internet to provide the "last mile" connection to the GSM network solves the major issue that DECT/GIP has faced. Had GIP emerged as a practical standard, the low power usage of DECT technology when idle would have been an advantage compared to GAN. There is nothing preventing an operator from deploying micro- and pico-cells that use towers that connect with the home network over the Internet. Several companies have developed so-called Femtocell systems that do precisely that, broadcasting a "real" GSM or UMTS signal, bypassing the need for special handsets that require 802.11 technology. 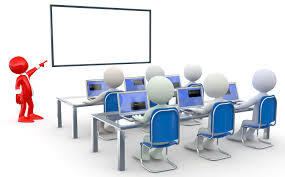 In theory, such systems are more universal, and again require lower power than 802.11, but their legality will vary depending on the jurisdiction, and will require the cooperation of the operator.